October and November at my house is basically devoted to seeing if I can survive on nothing but pumpkin. Baked goods, specialty coffees, ice cream...if it's pumpkin I'm going to try it, much to the rest of my family's chagrin. The other night I was noshing on a container of Chobani’s Pumpkin Spice Greek Yogurt when Mudpie started sniffing around. (That girl loves her yogurt.) I know pumpkin is very nutritious for humans and animals alike, but I've never had a cat show any interest in it. So before I started toting Mudpie around in her Sleepypod carrier on my next trip to Starbucks for a pumpkin Frappuccino (just kidding! ), I decided to do a little research on what cat parents need to know about adding pumpkin to their pet's diet. 1) The most important thing to remember is that you want to purchase pure, canned pumpkin, not pumpkin pie filling which is loaded with spices, sugar, and other additives. You can cook and puree your own pumpkin as well. Either can be fed to your cat directly or mixed in with their wet food. 2) Parts of the pumpkin you won't want to feed to your pet are the stem (rough on the digestive tract), the gooey pulp, and the skin which also won't digest well. Raw pumpkin is not recommended either. 3) Don't cut up your carved Halloween pumpkin. It's been sitting around for days and has likely been collecting mold and bacteria. 4) Pumpkin seeds can be fed to cats, but they need to be cleaned, roasted and ground up before being added to their food. 5) If kept at room temperature for an extended period of time pumpkin will spoil. If you plan to use it quickly keep it covered in the refrigerator. If you plan to use it more slowly, fill an ice cube tray with spoonfuls of fresh or canned pumpkin and freeze it. Now you have perfectly sized portions when you need it! 6) Pumpkin is nutrient-rich and beneficial for many of your cat's bodily systems, containing potassium, calcium, iron, zinc, vitamins A, C, and E, as well as carotenoids such as beta-carotene and lutein. 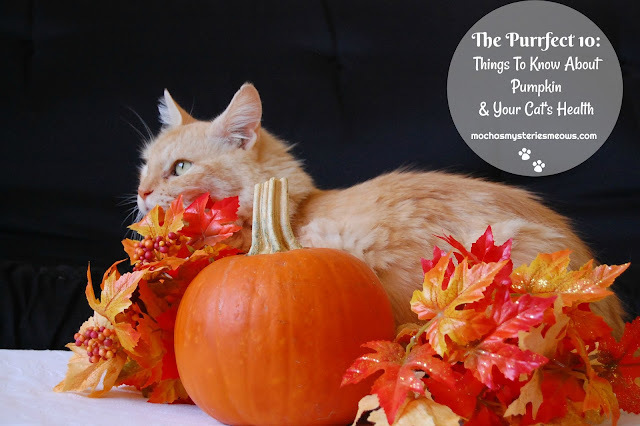 7) Fiber can help with constipation in cats, and pumpkin has 3-5 grams per cup! The bulk acts as a laxative by stimulating the gastrointestinal walls to contract, resulting in a bowel movement. For this reason pumpkin also works well in relieving hairballs. 8) Conversely, the fiber in pumpkin can also help with diarrhea by absorbing excess water and firming up the stools. Whether you're using pumpkin to treat either constipation or diarrhea, start with a half to one teaspoon and increase with caution. You don't want your cat to go from one extreme to the other! 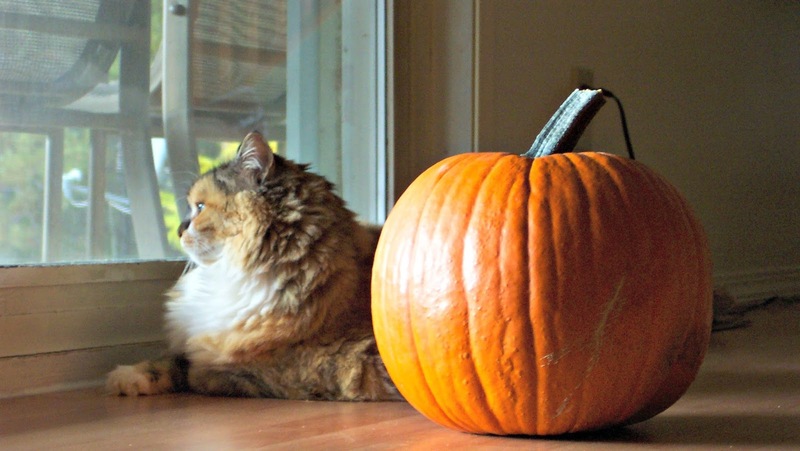 9) Pumpkin is great for your cat's weight loss regimen too! The addition of a half to one teaspoon to her meal means fewer calories, but the fiber promotes the feeling of a full tummy. 10) Looking for new ways to combat dehydration? Pumpkin flesh contains about 90% water! As with any change you make to your cat's diet, it's always wise to consult with your veterinarian first. They can best advise you to the correct amount and frequency for your pet's needs. 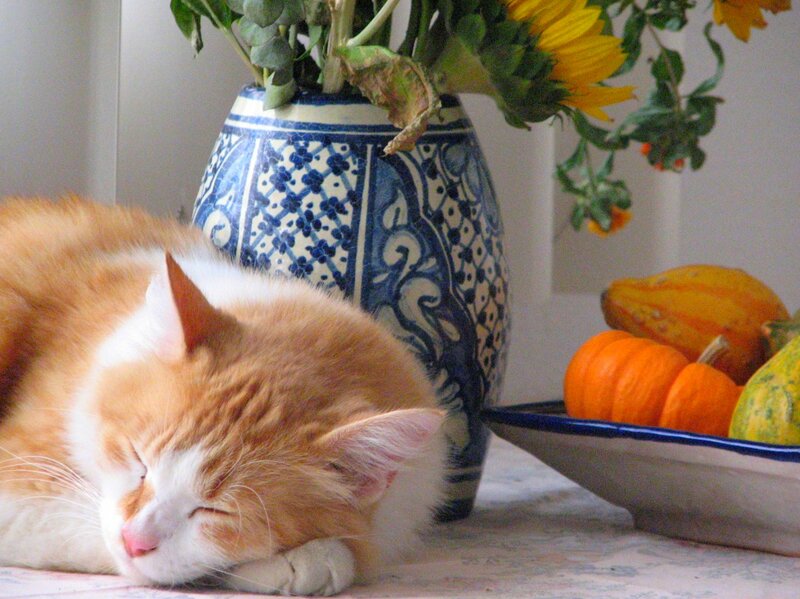 Have you ever added pumpkin to your cat's food? Did you find it to be beneficial? I love pumpkin! But my human says I'm fine and don't need it as a supplement. She used to give it to Binga, but she didn't like it and it made her eat less of her food, so she stopped. We have not tried pumpkin. I wish even one of the furbabies around here would eat pumpkin! It can offer so many health benefits, but not even a single one of them likes it. Thank you for sharing these wonderful tips with us, Mudpie and Melissa! Interesting. Thanks, Melissa (and Mudpie)! Heather says "Eat that pepita meal when the human sprinkles it on top of the yummy greasy goo inside a little flat can. Don't think you like it? All the more for ME." We mixed organic canned pumpkin into Angel and Chuck's meals for years, but finally gave it up because the only thing that's really helped Chuck's intestinal issues is budesonide. However, this gives me an idea about The 'O' Cats food! Fantastic post! I've long heard anecdotal stories of cats and pumpkin ... and always meant to do more research (which never happens). I truly love your posts - there are more than a few that I've saved (the one of vaccinations comes to mind first) - thank you for being such a good source of information on keeping out kitties healthy! I have tried, but Joanie is the only one that will eat it. I love the pumpkin soup in my Weruva but hate pumpkin chunks in any cat food. Go figger. TW said she's glad she doesn't like pumpkin spice stuff cos she read stores charge a lot more for them. One thing she goes love is DD's pumpkin muffins. My two cats won't eat pumpkin. Occasionally, some of my fosters will eat it, but not often. It's unfortunate because it's good for firming up soft stools (which is pretty common in foster kittens). Fortunately, my current litter of 7 fosters have eaten pumpkin in their wet food, which did help. Yep, we've added pumpkin before - for both our cats and our dog! And I'm like you, I'll try pumpkin anything! Although there's definitely some things that I don't end up liking.